All TissueFAXS upright systems configurations (Fluo, Histo, PLUS) of are also available as TissueFAXS SL SlideLoader High Throughput systems. In this configuration, they are additionally equipped with an automated robotic slide loader and a specially adapted version of the TissueFAXS scanning and image managagement software. TissueFAXS SL Slideloader systems are also available in Scan Only configurations. TissueFAXS SL Slideloader systems can be upgraded to the same configurations as the non-loader systems (Histo and Fluo to PLUS, epifluorescence to Confocal or HIgh Speed). TissueFAXS SL systems are available in 40, 80 and 120 slides configurations, allowing customers to have systems better adapted to their requirements. Customers starting out with a 40 configuration can later upgrade to 80 or 120 slides. 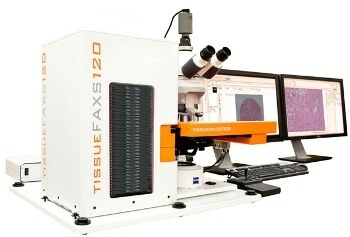 TissueFaxs SL systems provide automatic scanning of brightfield and/or fluorescence slides. 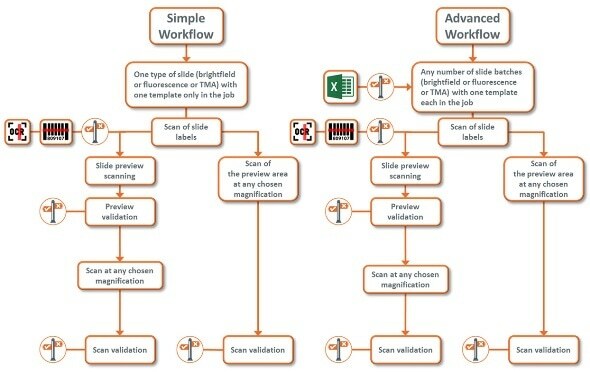 TMA scanning is supported in all configurations. Combined with TissueGnostics integrated high-speed cameras it provides High Throughput for slides with a speed and versatility in the top range. TissueFAXS SL is capable of oil immersion scanning. TissueFAXS SL comes with a new version of the TissueFAXS software designed for the perfect handling of the high amount of samples, data validation and storage. TissueFAXS 120 integrated slide label reading system digitizes barcodes and alphanumerical printed slide labels and also stores and displays high resolution label images.